When exactly do mother nature’s critters go from being cute animals and harmless insects to being actual annoying pests? From a homeowner’s view, it happens just as soon as they invade your living space! And if you’ve discovered that these pests have done damage to your home or property, then it’s time to take action and call the expert Minnesota MN pest damage repair team. Eco Tech specializes in all types of pest damage repairs in Minneapolis and the surrounding areas from any type of pest and animal that can range from ants and bees, to squirrels and racoons. 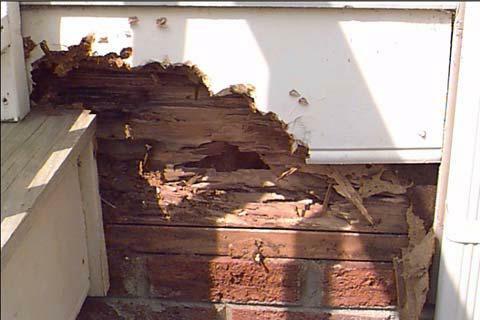 Pest and animal damage repair is not just about patching holes to make repairs, to do it correctly, there are several important steps that are involved. The professional pest damage repair techs at Eco Tech not only make sure your property is repaired and securely restored, but we will also safely remove any pests, clean the affected area of any debris and harmful waste, and then protect your property from future invasions. When it comes to certain types of pests, it’s not enough to simply eradicate them from your home once you spot them. As harmless as they might seem, these tiny insects can make a huge dent on the condition of your home. Depending on how long the pests inhabited space in and around your home before you noticed them, your property may benefit from a thorough professional pest inspection. Given enough time, pests can do a considerable amount of serious damage to homes, their foundations, attics, exteriors, walls, and even any surrounding buildings. Knowing exactly what type of damage each pest is capable of doing to homes is one of the benefits of hiring the professionals at Eco Tech. Our expert technicians will make a damage assessment to determine what type of pest has invaded your home, and the extent of the damage to your home and property. In many cases, homeowners aren’t even aware that animals have taken refuge in their homes, so they are taken by surprise when they learn that the damage is extensive. Squirrels are notorious gnawers and can quickly do a great amount of damage to siding and areas near rooftops as they look for safe and cozy nesting areas. If you’re ready to take back your home and your peace of mind, call the pest control experts at Eco Tech today at 763-785-1414, day or night.